TEMPE, AZ — A flock of swans have nested at Tempe Town Lake. 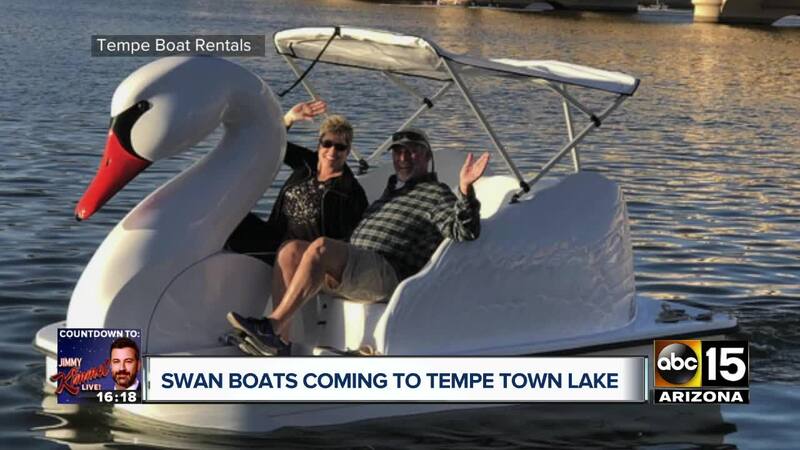 Tempe Boat Rentals, the private company that operates the boats at Tempe Town Lake, has purchased five swan-shaped pedal boats. The boats can hold up to four people and have a canopy. They can be rented for $40 per hour and $55 for two hours, according to its website . The company also added a fleet of red, shiny pedal boats, which seat four people and can be rented for $30 an hour and $45 for two hours. Reservations for the red pedal boats can be made online, boats4rent.com/tempe-az/tempe-town . As of late Monday, there was no button online to book the swan boats. On Wednesday, March 20, the company will offer free pedal boats rides to early birds from 5 a.m. - 10 a.m.